If long hair is a woman’s crowning glory, as the writer of the epistles tells us, what of her hat? A milliner is a maker of women’s hats. Magwaza should know. 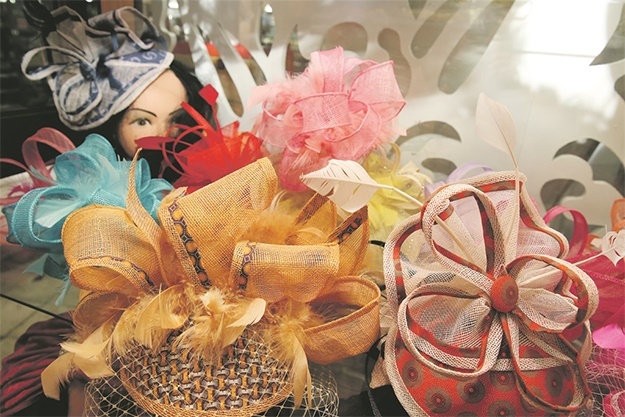 She’s built a business making women look their best by crafting hats to suit them and the occasion. And at this time of the year, the occasion is likely to be next Saturday’s Vodacom Durban July, a day when the fillies in their frocks and fascinators eclipse the horse racing action. 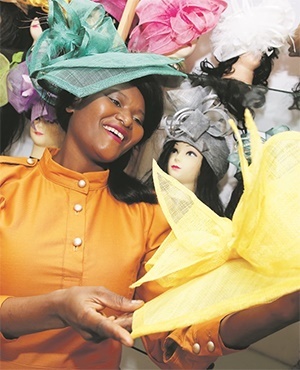 City Press met Magwaza at her shop, Zipho Creations, near Durban’s Grey Street precinct, this week. It was morning, but we found her remarkably poised for someone who had just slept the night there, after finishing an order at 2am. Apart from always delivering on deadline, Magwaza attributes her success – she has a regular clientele of dress designers and her own shop – to hard work and faith. She credits God with inspiring the creations she puts together in her mezzanine workshop from sinamay, vivid-coloured fabric and feathers. Sinamay is a natural fibre used as a foundation in hat-making. Magwaza brushes off the long hours: “It’s not a burden; I like it.” But establishing her business has clearly been a long haul. It began around 2009, when she quit her job. The 36-year-old reckoned it was in her blood. Her mother and grandmother were creative and gogo was a dab hand at sewing. Magwaza signed up with the Lindiwe Kuzwayo Academy of Fashion Design, in Durban, for two years, where she had to design dresses for July fashion shows. One of her outfits needed a hat to accessorise it and she ended up making it herself. Soon Magwaza was making hats for other students and later taking orders from more established designers. After graduating she started small, subletting space from a dressmaker in a sixth-floor building in central Durban. “To get exposure was not easy,” says Magwaza. Apart from customers calling at the dressmaker, there was little passing trade, but Magwaza was no slouch at drumming up business. She took her hats to church to show the other women there and printed flyers with pictures of her work, which she pasted up at hair salons. Orders trickled in, but without a place she could truly call her own, Magwaza would sometimes have to meet a client on the street to receive commissions. She took advantage of opportunities to attend business fairs and other shows with the support of the eThekwini municipality and the KwaZulu-Natal department of economic development – a marketing tool she still uses. Business grew and, in time, Magwaza was able to rent her own premises, this time on the fourth floor of the same building. From there she moved to the aptly named Lockhat Arcade, subletting space in a shop that sold mainly saris and other Eastern attire. Two years later, the sheriff came knocking and the sari shop closed. She was able to lease a shop of her own in the same complex. This was vital, as she built up a regular following, including dressmakers who called with clients when they were in the precinct, visiting its many fabric suppliers. Apart from the July, Magwaza says she was kept on the hop crafting hats for churchgoers. Easter was particularly busy. Weddings and funerals were money-spinners too. She believes hats have remained in fashion over the years, and have received a lift from the decade’s two big British royal weddings. Clients often come in inspired by the Windsor circus or clutching a picture from a magazine or Google. But what exactly are they after? “The ladies, they want something different. They come for unique things. “For young ladies I make fascinators,” she says, referring to the decorative headpieces. Hats off to you, Nozipho Magwaza.